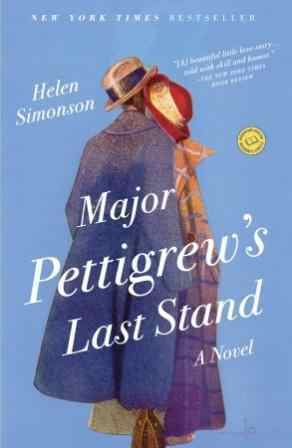 One of the best love stories I’ve read in the past few years, Major Pettigrew’s Last Stand depicts the relationship between the staid, stiff-upper-lip English gentleman Major Ernest Pettigrew (retired) and the warm, friendly Pakistani shopkeeper Mrs. Jasmina Ali. I love the subtle, almost repressed, romance between the butler and the maid in Kazuo Ishiguro’s Remains of the Day, and Major Pettigrew features a similar romance: a multi-cultural Remains of the Day in a small English village. In the village of Edgecombe St. Mary, the blossoming romance between Major Pettigrew and Mrs. Ali is not controversial at all, mostly because none of the villagers even perceive it as possible. Though Major Pettigrew was born in India and Mrs. Ali was raised in England, the villagers insist on maintaining their image of him as the quintessential Englishman and her as absolutely foreign. In an especially telling – and hilarious – scene, the villagers decide to throw a Mughal-themed party, and ask Mrs. Ali about Indian history, completely ignoring Major Pettigrew’s interjections about all the historical inaccuracies in their party plans. Helen Simonson’s language is wonderfully subtle. The attraction between Major Pettigrew and Mrs. Ali is beautifully suppressed, with the tiniest steps made significant yet handled very delicately. Take for example a scene near the beginning of the novel, where Major Pettigrew considers dropping by Mrs. Ali’s shop: “He… decided that he might benefit from a short walk through the village. He might stop in at the village shop to purchase some tea. It would, he thought, be generous of him to make a visit and give the busy Mrs. Ali a chance to make her excuses for not coming to see him.” So much emotion is kept between the lines, and that just makes it even more potent. While Major Pettigrew and Mrs. Ali are physically attracted to each other, their connection is rooted firmly in friendship, particularly in a shared love of literature and conversation. Because both characters are past middle age, they both also have to contend with family issues, with being thought of as irrelevant. Major Pettigrew’s “last stand” refers to a gun that belonged to his father, which Major Pettigrew wants to keep but which his son wants to sell to advance his own career. These just add texture to their growing relationship, and Simonson interweaves the various subplots masterfully. Major Pettigrew is Helen Simonson’s first novel, and I definitely look forward to reading more of her. Major Pettigrew is a beautifully written, subtle love story, which also deals with issues of culture, family and the very human need to find someone to grow old with. This entry was posted in Book Reviews and tagged 50BookPledge2011, ARC, Fiction, Random House, Romance by Jaclyn. Bookmark the permalink.